Features: One needle zigzag and straight stitch in the production of sails, parachutes, carpets, leather goods and technical textile; Extremely strong needle penetration force, can easily sew sturdy webbing reinforcement and extra thick corner patches; One of the heaviest industrial zigzag sewing machine in today market, is capable of powering its needle through 20mm of Dacron, Kevlar, Webbing, Canvas and leather; The extra large shuttle hook and bobbin capacity reduces the number of bobbin changes and offer high efficiency even sewing with extra thick thread up to size V207 (including sizes V92,V138 etc); The basic mechanics (Shuttle hook, adjustments and times) is the same with Adler 166 and Adler 266, therefore it is easier for the manufacturers who already worked with Adler zig-zag sails sewing machines. Application: decorative and functional stitching in the production of sails, parachutes, trampolines, carpets, isolation blanket, braided rugs, shoes, footwear, sofas, upholstered furniture, quilting, cushions, webbing slings, safety belts, harness, saddles, tents and awnings. Ropes and cordage for Arborist climbing ropes, Climbing & Caving Ropes, Boating & Marine Ropes, Rescue Ropes and rigging operations. 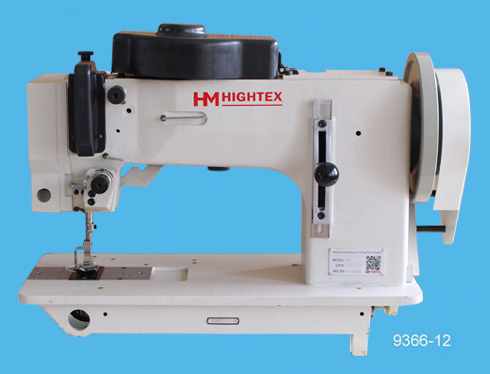 Features: It is affordable heavy duty zig-zag sail sewing machine for most sail makers and repairs ; It is an economical but high-performance. 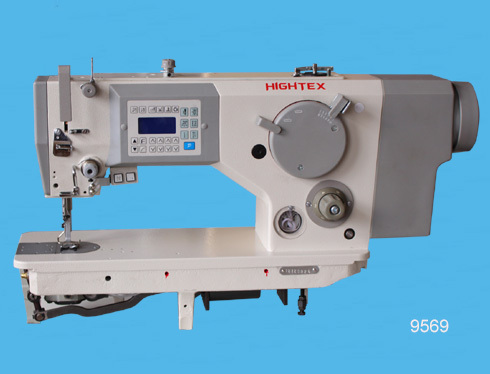 This machine is capable of powering its needle through 20mm of Dacron, Kevlar, Webbing, Canvas and leather; Extremely strong needle penetration force, can easily sew sturdy webbing reinforcement and extra heavy sail corner patches; The extra large shuttle hook and bobbin capacity reduces the number of bobbin changes and offer high efficiency in sewing sails, tents and tarpaulins, using extra thick thread up to size V207; Easy to change cam for straight stitch, 1-step (2-points), 2-step (3-points), 3-step (4-points) zigzag, cover all demands of modern sail making industry; This robust and reliable sail sewing machine is designed for mass-production sail making business; With strong servo motor (Powerful + Quiet + Accurate Speed Control, different from so call "Energy Saving Servo Motor"or "Power Saving Servo Motor" in the market. 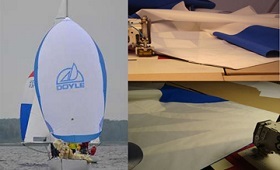 Applications: sails making and repairing includes cruising sails, racing sails, storm sails, tents, carpets, parachutes, tarpaulins, marquees, shade sails, mattress, truck covers, sofas and upholstered furniture. 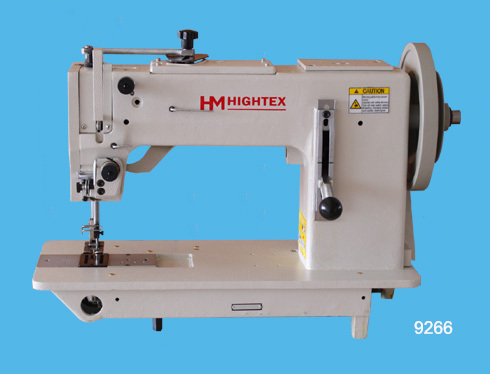 Features: Extreme wide zigzag width (16mm); Powerful walking foot mechanism insures the smooth feeding of hard-to-feed materials or multi-layered sections of materials to achieve consistent seam quality that is free from irregular stitch pitches; Extra large shuttle hook and bobbin capacity offer high efficiency; It is the unique walking foot sewing machine in thick thread, heavy weight zigzag sewing section; Special sewing attachment are available as optional for high productivity and perfect seam quality, including piping foot /cord foot for attaching ropes to netting and make sewn eye termination at end of braided ropes (working as rope-end-bar tacking). 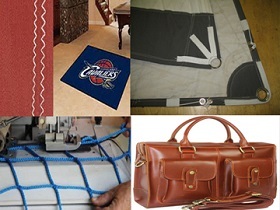 Applications: joining two pieces of carpets, mats and rugs together by zigzag stitch or overedging thick carpets, mats, wool blankets, cotton rugs, braided rugs, isolation blanket; It is capable of attaching ropes to nets, joining nets together, and serging / finishing the edge of netting, such as fishing nets, sports nets, cargo nets, safety nets, agriculture nets etc. Standard supplied with three different cams, suitable for 2 step, 3 step and 4 step zig-zag; Extreme wide zigzag width (16mm); Powerful walking foot mechanism insures the smooth feeding of hard-to-feed materials or multi-layered sections of materials to achieve consistent seam quality that is free from irregular stitch pitches; Extra large shuttle hook and bobbin capacity offer high efficiency; Easy to change cam. 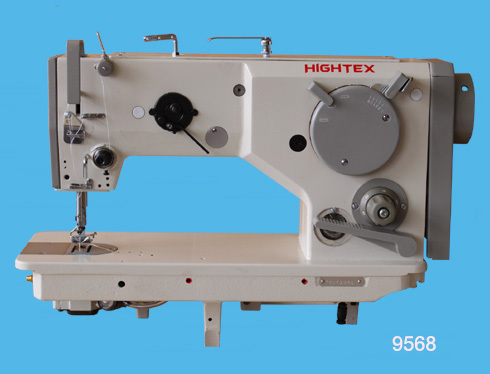 It is the unique walking foot sewing machine in thick thread, heavy weight zigzag sewing section; With strong servo motor (Powerful + Quiet + Accurate Speed Control, different from so call "Energy Saving Servo Motor" or "Power Saving Servo Motor" in the market. 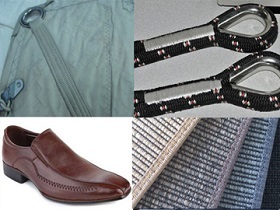 Applications: Corner patching or webbing reinforcement on sails, parachutes, marquees and tents; Decorative or functional stitch on leather sofas, car seat covers, luggage, shoes, industrial safety product and leather goods. 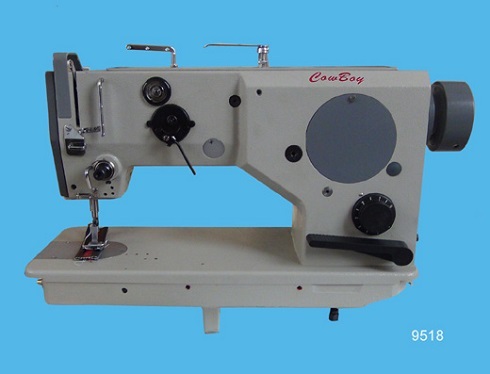 Features: It employs a parallel vertical needle bar motion for stronger striking power and can easily sew sturdy webbing reinforcement and heavy duty corner patches; Its modern design features: a zigzag width of up-to 10 mm and a stitch length of up-to 5 mm; This zigzag sewing machine is capable of powering its needle through 7 mm of Dacron, Kevlar, Webbing, Canvas and leather; The hook containing the lower bobbin is twice the normal size, resulting in fewer bobbin changes and in combination with the vertical take up lever system, it is of particular use when using thicker than normal sewing threads; 9518 (similar to Adler 525) is recognized as the best spinnakers sewing machine in modern sail making industry, standard supplied with 4 cams for straight stitch, 1-step (2-points), 2-step (3-points), 3-step (4-points) zigzag. Applications: spinnakers, windsurf sail, parasail, Code Zero, awnings, filters, parachutes, shoes, footwear, medical apparatus, canvas, tarpaulins, braided rugs, wet suits, textile slings, handbags, sports apparatus, blinds, nets, bandages, straps, Velcro, Neoprene, body supports etc. 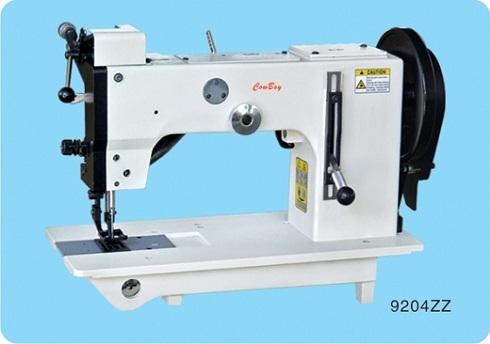 Features: It employs a parallel vertical needle bar motion for stronger striking power and can easily sew sturdy webbing reinforcement and heavy duty corner patches; Its modern design features: a zigzag width of up-to 10 mm and a stitch length of up-to 5 mm; This zigzag sewing machine is capable of powering its needle through 7 mm of Dacron, Kevlar, Webbing, Canvas and leather; The hook containing the lower bobbin is twice the normal size, resulting in fewer bobbin changes and in combination with the vertical take up lever system, it is of particular use when using thicker than normal sewing threads. 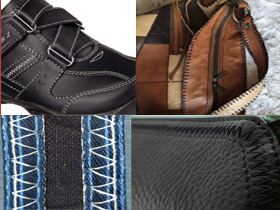 Applications: For functional and ornamental stitching shoes upper, footwear, sofa covers, leather bags, handbags, sports apparatus, wet suits, filters, parachutes, spinnakers, windsurf sail, blinds, nets, bandages, straps, Velcro, Neoprene, body supports etc. 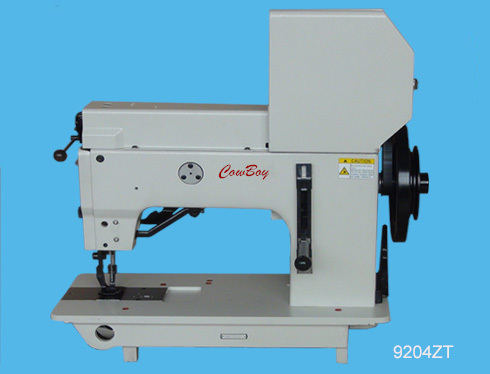 Features: This computerized, direct-drive, high-speed, lockstitch, Zigzag stitching machine features in automatic thread trimmer, automatic presser foot lift and automatic backtacking (reverse stitch);	The new auto thread trimming system cut thread very short that eliminate manual thread trimming operations to improve productivity; It employs a parallel vertical needle bar motion for stronger striking power and can easily sew sturdy webbing reinforcement and heavy duty corner patches; Its modern design features: a zigzag width of up-to 10 mm and a stitch length of up-to 5 mm; This zigzag sewing machine is capable of powering its needle through 7 mm of Dacron, Kevlar, Webbing, Canvas and leather; The hook containing the lower bobbin is twice the normal size, resulting in fewer bobbin changes and in combination with the vertical take up lever system, it is of particular use when using thicker than normal sewing threads.